View More In Personnel Forms. Since 1952, TOPS has provided quality products and services to businesses throughout the world. TOPS continues that commitment providing innovative, high quality value-added paper products for the office, school and home. 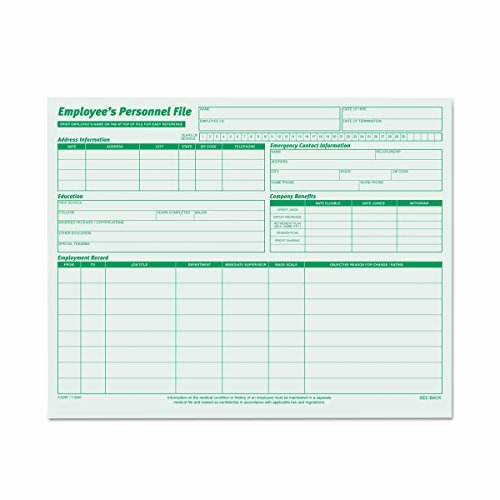 Employee Record File Folder includes all you need to build a complete employee record. Carefully researched record folder will help maintain thorough information on every employee, in a legal manner, in one place. File folder is particularly useful for a post-hiring inquiry of a new employee. Employee Record File Folder is designed to fold so confidential information is inside the folder. Design features green ink printed on green stock. File folder is made be inverted for confidentiality. Whether it's a multi-part form, notebooks, writing pads, record books, or any of the hundreds of items we offer, you can count on TOPS products to help!